Rhinebeck Equine LLP provides a full spectrum of care for neonates. At the farm, our veterinarians perform neonatal examinations within 24 hours of birth, assessing IgG levels and the overall health and condition of the foal and dam. When a mare experiences a difficult birth, our experienced doctors give immediate emergency attendance at the farm or at the hospital. 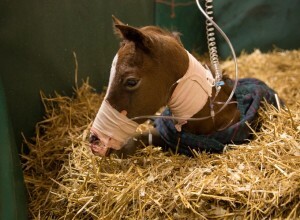 In the spring, the internal medicine department’s focus is on critically ill neonatal foals and their dams. In the hospital, we provide care for compromised foals that require an intense level of professional attention. We are experienced in treating foals with birth asphyxia (Neonatal Maladjustment Syndrome, “Dummy” foal), prematurity, septicemia, diarrhea, limb deformities, and other conditions. We also frequently treat foals for septic arthritis, limb deformities, umbilical abscesses or hernias, and many other problems. Our experience and dedication to providing the most up to date care for your foal helps to insure the best outcome possible. We receive and treat foals with a wide variety of problems, and our goal is to achieve the best outcome for each patient while staying within the budget of the owner. By frequently assessing the patients’ progress, our internist can help owners make appropriate decisions. We are proud of the many successful outcomes that our team achieves. Dystocia (difficult birth) is a team effort at Rhinebeck Equine. Our dystocia team includes surgery, medicine, and anesthesia staff members, each with a well-defined role. Each case is immediately evaluated and handled quickly to maximize foal survival. The surgeon corrects the malposition, and then delivers the foal with the mare standing, under anesthesia, or via Caesarean section if necessary. 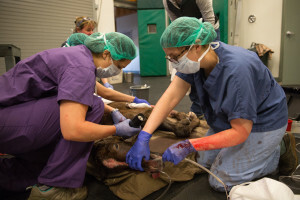 The internal medicine specialist and neonatal team provide care for the foal during and following delivery as these foals often require intensive care to survive. Millbrook Equine and Rhinebeck Equine are working together to make a colostrum bank available to local breeding farms. In order to make it successful, we need your help! Your donation to the bank will ensure that we have colostrum on hand for all foals in need.